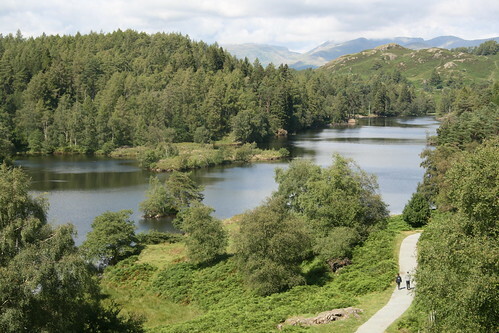 The Tarn Hows area originally contained three much smaller tarns, Low Tarn, Middle Tarn and High Tarn. Wordsworth's Guide Through the District of the Lakes (1835 edition) recommends walkers to come this way but passes the tarns without mention. Until 1862 much of the Tarn Hows area was part of the open common grazing of Hawkshead parish. The remaining enclosed land and many of the local farms and quarries were owned by the Marshall family of Monk Coniston Hall (known as Waterhead House at the time). James Garth Marshall (1802–1873) who was the Member of Parliament for Leeds (1847–1852) and third son of the industrialist John Marshall, gained full possession of all of the land after an enclosure act of 1862 and embarked on a series of landscape improvements in the area including expanding the spruce, larch and pine plantations around the tarns; demolition of the Water Head Inn at Coniston; and the construction of a dam at Low Tarn that created the larger tarn that is there today. By 1899 Tarn Hows was already an important beauty spot. H.S. Cowper mentions "Tarn Hows, beloved by skaters in winter and picnic parties in summer. Here comes every day at least one charabanc load of sightseers from Ambleside or Windermere". A wooden boat house that was still standing in the 1950s at the south east corner of the tarn probably dated from this period. In 1913 G.D. Abraham said "Tarn Hows is set wildly among larches and heather slopes, more like a highland lake than the other waters in Lakeland... more suitable for pedestrians than motorists". In 1930 the Marshall family sold 4000 acres (16 km²) of their land to Beatrix Heelis of Sawrey (better known as Beatrix Potter) for £15000. She then sold the half of this land containing the tarn to the National Trust and bequeathed the other half to them in her will. The National Trust have made a number of more recent changes to the area including moving the car parks to a less obtrusive place in the 1960s and general footpath and road improvements to minimize the damage caused by the visitors. In May 2008 a building designed to harmonise with the landscape was opened, providing toilets and an information display under a sedum roof.